Karel Paukert brought a grand vision to the Cleveland Museum of Art (CMA) in 1974 when he succeeded Walter Blodgett as curator of musical arts. Besides continuing Blodgett’s commitment to organ recitals, chamber music concerts, contemporary music performances and the commissioning of new works, Paukert planned to present dance concerts, educational programs, a summer series, multimedia events and small-scale recitals in galleries. Not only did he accomplish his goals during his 30-year tenure, he also enlarged the museum’s keyboard collection, introduced jazz concerts, sponsored residencies by local musicians, made recordings on McMyler Memorial Organ in the museum's Gartner Auditorium and brought CMA's music program to world-wide attention through his solo tours and frequent participation on juries for international organ competitions. “He expanded what the museum was doing in terms of the variety of performance, first in the musical area and then in other areas as well,” said Katharine Lee Reid, the sixth director of the museum. Born in the village of Skutec, Czechoslovakia (now the Czech Republic), on January 1, 1935, Paukert studied oboe and organ at the Prague Conservatory. Because of repressive Stalinist policies during his youth, he had little access to forward-looking 20th-century music. Yet, he managed to acquire forbidden recordings and scores, and he developed an insatiable hunger for new music. In 1961, Paukert broke through the Iron Curtain by obtaining permission to become principal oboist of a symphony orchestra in Iceland. After his stint in Reykjavik, he enrolled at the Royal Conservatory of Ghent, Belgium. In 1964, he entered an international improvisation competition in Haarlem, Holland, which led to an invitation to make his American debut in Chicago. Following a national tour, he was invited to study and teach at Washington University in St. Louis. There, he met his future wife, soprano Noriko Fujii. 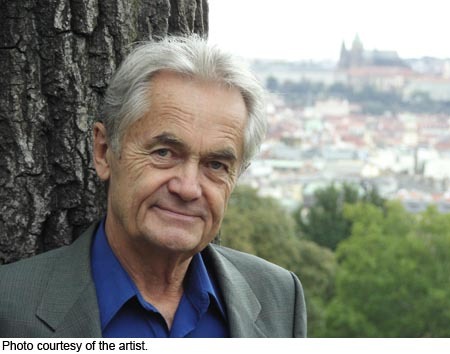 Before coming to Cleveland, Paukert taught at Northwestern University in Evanston, Illinois, and directed the music program at that city's St. Luke’s Episcopal Church. At the Cleveland Museum of Art, he played at more than 800 recitals and organ demonstrations, commissioned music from local and international composers, mounted the daring Aki Festival of New Music and accompanied instruments as diverse as synthesizer and Chinese erhu. His eclectic repertoire, often performed from memory, ranged from obscure Czech music to the latest avant-garde experiments. With the aid of CMA's Musart Society, he acquired several small keyboard instruments based on historic models. Despite acclaim as a brilliant performer, he retained the immigrant values of “somebody who comes to America with a suitcase and realizes his dream,” and he remained a humble servant of music, functioning as stagehand, usher, page-turner, organ pumper and convivial host of post-concert parties.